If you are looking for the best singles sites on the web today, it is always important to see the upsides and downsides of each site you find appealing. While most online dating services will always show their best “faces” to potential users of their site, you should not be contented enough of what you read first based directly from their site. Online dating site reviews are good and helpful sources to help people searching for love online to have a better understanding of what comes to their money after signing up for a paid membership fee. Taking an in-depth review about www.beautifulpeople.com can help you understand the pros and cons of using their dating service. The site lives by its name – Beautiful People. This means that only beautiful people can become members of the site. Yes, that’s right. If other members do not find you to be beautiful enough, they can oust you out of the site as a member even if you already paid for your membership. This is quite unfair, especially when you have already spent time creating your profile and paid a substantial amount to pay for your membership to be able to access the site’s features. If other members will not find you attractive enough, then you should expect not to belong to the site. This is a misfortune of many online subscribers of the site who find it as a disgusting experience when they are suddenly ousted from the site by other members who do not find them to be physically attractive. The biggest downside of using the site is the likelihood of finding people who are giving more weight to people based on physical attraction. Members can always vote off others who are subjectively not beautiful in their eyes. While this may be very unfair to the other members who paid in order to enjoy the privilege of using the site’s features, the site always upholds the mandate of keeping only beautiful people as regular members. 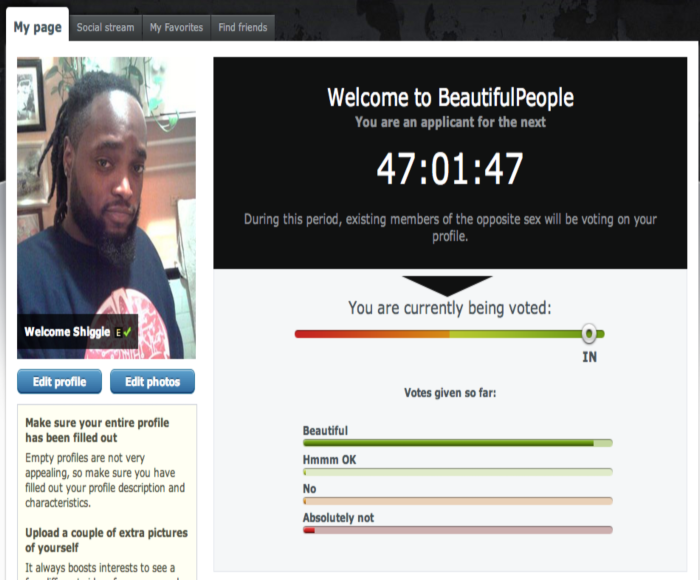 Unlike the other best singles sites that allow their members to date whomever they want, ugly or beautiful, you should expect that ugly people will have no place to be using the www.beautifulpeople.com. In order to start using the site features, you are required to create a profile so that the other members of the site can vote for your value as a site member based on your physical attractiveness. It gives the feeling of being on a trial and being judged according to your physical merit. This experience can be horrifying to some who attempt to make as a member of the site. The moment you get to the site’s homepage you will find yourself being compelled to search deeper for your best photo to upload as your profile picture. Other members will use this photo as a source of judging your physical attractiveness. Within 48 hours after completing your profile, active site members will begin to vote for your worthiness to become a member of the site. Perhaps the worst part is the waiting period. You can see directly from the site how the voting progresses through the graph tallying the votes you get from the other site members. The grueling moments of waiting can really take on your nerves and some just end up feeling highly disappointing and embarrassed after being voted on as ugly. So, what is the point of bringing yourself into such humiliation? If you find yourself not beautiful or attractive enough, you should not consider using the site to search for your perfect match. You are better off using the other best singles sites that encourage members to get to know each other beyond the physical aspect and develop a genuine love that is not superficial. One need not emphasize the danger of meeting people to date with a fake profile on the site. In an attempt to meet and date gorgeous men and women, one may be tempted to use a fake photo, and a beautiful one at that, in order to gain a favorable vote from the other site members. The risk, therefore, is there may be some members using a fake photo of themselves just to win the votes of the other members. Most of the time, it is difficult to tell whether the person you are dating online is exactly the same person whom you are seeing in their profile picture. Desperate people who badly want to find a hot date from online dating sites will likely do everything and anything just to become a member of the most beautiful circles in the online dating market. It will cost you $75 for a membership fee. You have no other subscription option other than a yearly subscription. You should first stop and assess whether you are willing to keep a long-term commitment to use the site. Remember, there is no way to cancel your membership and other site members can vote you out of your membership even if you already paid your membership fee. If you want to gamble your $75, then you should go ahead and sign up. But you should take another second of considering the gamble you will be taking once you have signed up for a membership. Is it love for real? For someone who is very particular about physical attractiveness, then www.beautifulpeople.com is an appealing option for you. But for many who are in search of true love that is defined beyond the physical attributes of the person, the site may not be for you. Users have acknowledged the fact that there are indeed beautiful people as members of the site, but as you go over their profile, you will not find something uniquely interesting about them. Perhaps you should start marveling about your option of using other online dating services that can provide you a wide database of quality dates to find other than being physically attractive.